Bristol will use the "hurt" of last season's Championship play-off final loss when they play Worcester on Wednesday, says wing Charlie Amesbury. Andy Robinson's side, who were pipped to promotion by London Welsh 12 months ago, face Warriors in this year's play-off final first leg at Ashton Gate. "There's a lot of hurt there that we can fall back on and memories that we don't want to repeat," said Amesbury. "That will provide some propulsion for us going into the final." He added: "It meant we missed out on another year in the Premiership which, as professional rugby players, is where we all want to be." This is Bristol's fourth appearance in the Championship play-offs in the space of six seasons, having previously been beaten by Exeter Chiefs and London Welsh in the final, and Cornish Pirates in the semi-finals in 2012. They are looking to return to the Premiership for the first time since they were relegated in 2009, when they finished bottom with only two wins from 22 matches. "We've spent a bit too long in this league," former Newcastle and Sale wing Amesbury, 29, told BBC Points West. "But with the backing we've got from the board and the coaching structure that's in place now, I think we're really ready and prepared for the Premiership. "And not just go in there and maybe just avoid relegation - I think we've got a squad that really could make an impact and maybe even get European Champions Cup rugby the following year. "But we can't look too much further than two big games against Worcester. As history suggests, we can't start talking about next year until we've dealt with this year." 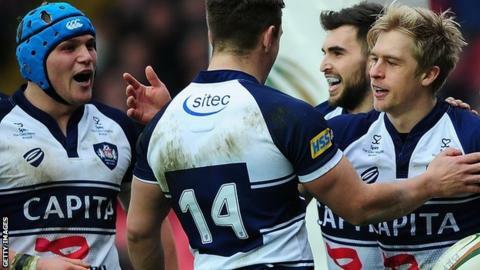 Bristol won 21 of their 22 regular-season matches to finish top of the Championship, six points ahead of Dean Ryan's Worcester, who they beat home and away. The Ashton Gate outfit overcame Rotherham Titans 56-36 over two legs to book a spot in the play-off final. "We put in a good couple of performances against Rotherham, but this is the one we've all been waiting for," said 33-year-old scrum-half and captain Dwayne Peel. "It's about having clarity in your game plan and about being relaxed. The closer it gets, the more tense everything and everyone will become, but it's about keeping calm and not playing the game before you're actually out there."